Mid-month, Eric and I spent 5 days in New York for a mini-vacation and a trip for my birthday! One of my absolute favorite things to do when I visit a new city is to poke around the different tiny antique/vintage/thrift shops in any given area, because it shows you so much about the culture. And of course, New York being known for fashion, they had so many options in Manhattan/Brooklyn alone, the areas we frequented. Find Raggedy Threads on Instagram here. We passed by this shop one day and decided to pop in the next. I noticed many of the clothes in here were new or slightly used, but from vintage-aesthetic brands (i.e. from small, independent designers -- their website confirmed this) I had a sweater similar to this that I had picked up from a flea market, but the fit wasn't good (as you'd expect from flea market clothes); so I was so happy to see that this cut and crop was just how I dreamed a sweater to be! It pairs perfectly with my vintage Moschino jeans from Afterlife. Find Awoke on Instagram here. Find Opening Ceremony on Instagram here. These are fast fashion items, but I wanted to share these because it's real life and the unfortunate reality of our economy/culture is that we can't always buy everything secondhand. In my own experience, it's nearly impossible to find well-fitting women's pants from thrift/vintage stores -- those that meet the criteria sell quickly, and you're left with a bunch of options that are nowhere near your size and cannot be tailored to your size (even experienced tailors can usually only take in waists for 1-1.5 sizes smaller, before the garment starts looking wonky). I've been looking some cargo pants and wide-leg pants, and so these fit my criteria. 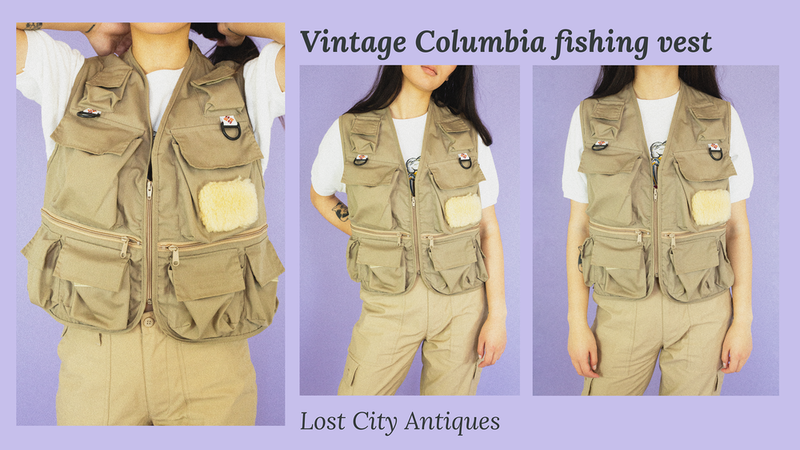 It's unfortunate that there are limited options for good quality women's used clothing, but I've also learned that a lot of vintage boutiques do ship around the country! So in the future I'll be looking for similar items from shops like Raggedy Threads online. Find Lost City Antiques’ website here. My sweet pal Bryan has really got me into antique postcards, and now I want to collect more of these types of oddities to use for my own artwork and design inspiration. Find Rugged Road & Co on Instagram here. These are the notebooks I've been using recently for all my work, and I love them because they're very minimal. No fluff or excess designs. Plus, they come in a variety of different sizes which I use for different needs (braindump sketching, client work, and everything else). Visiting this shop was a great opportunity to stock up on some zero waste essentials! I've been needing a reusable boba straw, a new straw cleaner, and new washcloths for removing makeup. Find Package Free Shop on Instagram here. That's it for our trip -- thanks for reading and I'd love to hear your thoughts in the comments or on social media! Stay updated with me on Instagram or Twitter. Thanks to Eric for taking these photos! !